The police department's 19th district, which includes Wrigleyville and Boystown, has seen its first manpower increase in years, the department says. The department's response to a CWB reader's Freedom Of Information Act request reveals that the district experienced a net increase of 11 officers—to 351 cops of all ranks—in April. 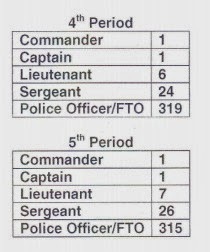 As of May 15th, the headcount sat at 350 cops. The district continues to operate with 25% fewer officers than it had in early 2012. The reader's FOIA request also sought department-wide manpower numbers. According to the department, there were a total of 12,029 officers of all ranks in the Chicago Police Department as of May 15, a decline of 137 officers since February.